This website has been temporarily closed. However, there will be some exciting news shortly. 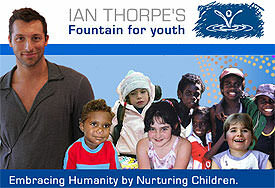 – Ian Thorpe website post, November 2006. It was a dramatic denouement. The press was waiting. Fellow swimmers were wondering. "It will be a huge announcement," one unnamed Australian swimming official told Associated Press. But on 21 November 2006, Ian Thorpe, arguably Australia’s greatest swimmer, announced that he would "discontinue [his] professional career". Only two days prior, he had made a personal decision to avoid swimming in the forthcoming World Championships. Glandular fever and a general loss of motivation had exacted their toll. 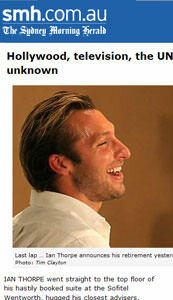 This was the "exciting" news promised on Thorpe’s own website; the realisation that he was only human. He would not be another addition to the pantheon of Australians who had overcome (admittedly more) serious conditions. His was an illness narrative with a negative ending. Kylie Minogue conquered cancer; Delta Goodrem fought back non-Hodgkin’s lymphoma; and Thorpe’s compatriot, long-distance swimmer Grant Hackett, returned from shoulder surgery. His premature departure still leaves a striking record. Five Olympic gold medals; world champion at fifteen; named "World Swimmer of the Year" four times by Swimming World Magazine; winner of eleven world titles. Perhaps one of the finest middle-distance swimmers that ever graced the pool. But these records propelled Thorpe beyond the pool. Corporate fashion giants sought him: Armani made him their ambassador. He trafficked in the lucrative market of underwear, jewellery, glorified celluloid (many would prefer to forget the appalling Undercover Angels). Beyond his swimming, Thorpe will be remembered as being a peculiarly different Australian sporting icon. Yes, he did what was expected of any Australian athlete. He broke records, brought home medals, abhorred failure. Yet he always seemed a touch too clean; not rugged despite his incredible strength; androgynous, even artificial in his space-age body suit. Unlike the coarser, less fluent Hackett, it all seemed so easy. Military, macho metaphors may have been used to label him (the "Thorpedo"), but he was never admitted to the cult of the Australian male. With such performing personalities as Thorpe, a new, slightly tortured word came into being: the metrosexual. The Age announced it in one its articles on 11 March 2003: "Macho man has bitten the dust." There was Thorpe; then there was David Beckham. Men could dress stylishly, be seen at catwalks, and not be stigmatised as homosexual. One could be fashionable and clean without batting for the other side. The pundits disagreed and the cult of the Australian male reasserted itself. Thorpe had to concede to being "a little bit different to what most people would consider being an Australian male". Metrosexual or otherwise, Thorpe’s success outside the pool revealed a commercial maturity. In this, he was already streets ahead of fellow sporting Australians. His personal attributes made him not merely marketable for one audience, but many. The Japanese swimmer Yumiko Nakagawa underlined this quality in July 2003. "He has a Western, non-Japanese look, but the way he behaves is very modest, very Asian I think." A commercial tutelage encouraged him to learn other languages, an inconceivable idea to the monolingual sporting establishment in Australia. His contemporary sporting personalities often prefer (by choice or otherwise) niche markets. His rival, the American Michael Phelps, intended to target sullen skaters. Thorpe’s countrymen attempt to corner more masculine markets (Shane Warne: hair-loss treatment), or they are dismissed as unruly, undiplomatic larrikins (Lleyton Hewitt). At times, given the hazards of celebrity, we can dismiss attributes such as "humility" and "modesty" as shallow incantations, the refuse of mass marketing. Under the strain of the media eye, what can we trust, let alone verify? (Essayist Malcolm Muggeridge called the former the "fourth temptation", a mendacious medium to be avoided.) But the Thorpedo was nothing if not earnest. He was quite frankly a moralising boy scout, scolding FINA for inadequate drug-testing procedures and promoting good-eating regimes for children. In this sense, Thorpe’s appeal is truly global. So much so that Adidas, somewhat idiotically, wanted to partner Thorpe with soccer galactico Beckham in an advertising bonanza. It was a revelation: few Australian sporting personalities could attract 12 million Japanese television viewers to a swimming event, let alone induce two star-struck Japanese fans to travel to Palau Sant Jordi in Barcelona for a chance meeting. He could be seen on billboard posters plastered with broken English ("Impossible is Nothing") in the Taiwanese city of Taichung in 2005, swimming-goggles glinting menacingly. Leaving aside the less than global appeal of cricket, Warne is hardly likely to be attracting a gaggle of hysterical Spanish girls to a training session. Hewitt’s chances of being greeted by adoring Argentinean fans is even more remote. In the end, Thorpe was swimming against himself. 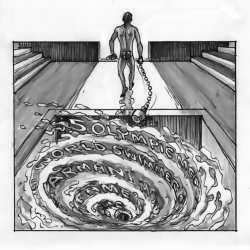 There were rivals, the mercurial Pieter van den Hoogenband, the petulant Phelps. But there was nothing left, other than the treadmill of performances. The admission came in his last conference: "I needed a closing point." There is reason for him to be proud. He admitted what many sports celebrities have been unable to: that mortality is no vice.